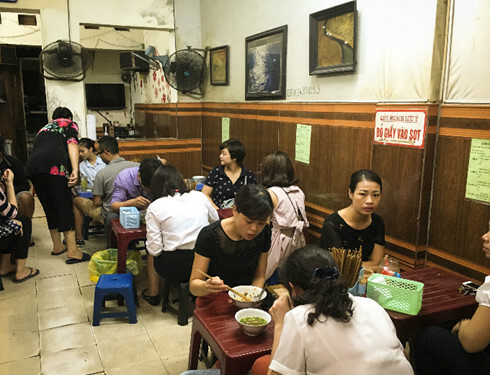 The thick, savory rice porridge has warmed bellies in Vietnam’s capital for over fifty years. Right around this time, Hanoi’s dreary monsoon rain becomes a pleasant drizzle. 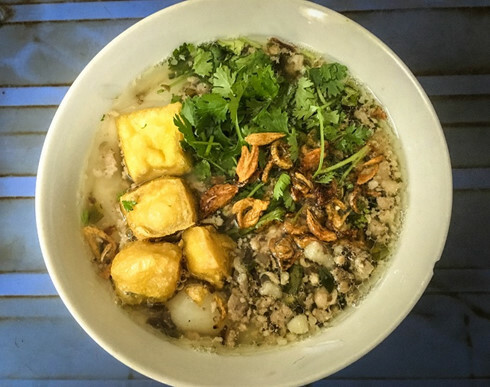 Few dishes compliment this change of seasons better than banh duc nong — a thick, savory rice porridge lovingly beaten out by tough old ladies in Hanoi’s slender alleways. “It’s the dish to relish in the breezy afternoons of early autumn.” wrote poet, revolutionary spy and proto foodie Vu Bang — fifty years ago. A tiny sign on Le Ngoc Han Street’s Alley 8 leads one directly to Mrs. Noi’s home. The woman and her family have served the dish for ages and have come to be regarded as banh duc royalty. 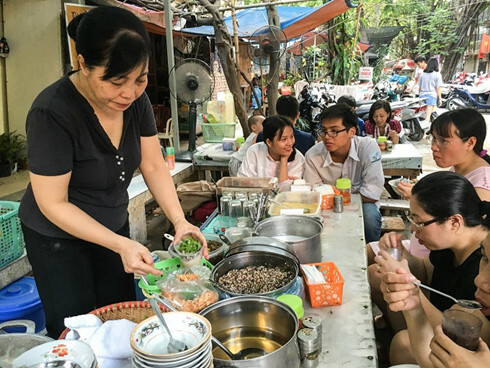 Mrs. Minh’s family remains hard at work continuing the tradition of Hanoi’s banh duc nong brunch in an old dormitory yard southwest of the city. 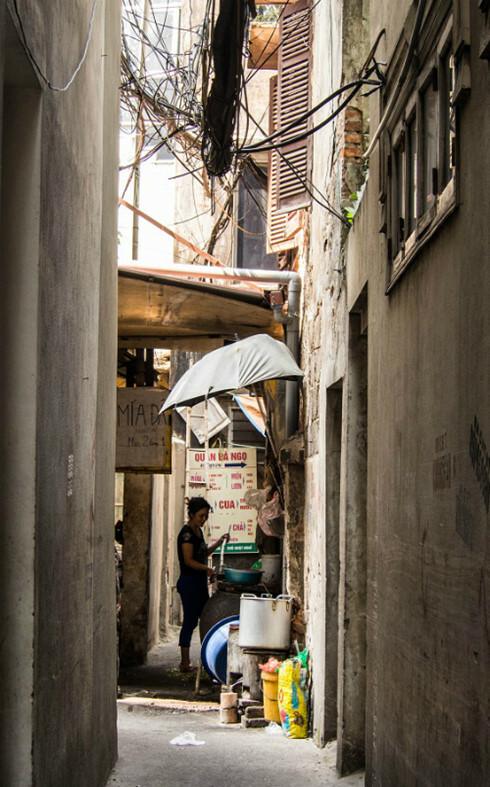 As you enter the narrow alley, mid-afternoon, look for the sign dangling from a skinny tree and scrawled with a phone number for take-away orders. “Wait right there; two minutes!” Minh’s husband cried on a recent morning as a line of couples, mostly in their late fifties, cheerfully obliged. While Minh slings the hot stuff, the poor old man juggles the orders coming into his cell phone and the narrow stretch of pavement where customers park.Next queue up for a spot on the long wooden bench where Minh’s more conscientious customers rush through their bowl in 10 minutes or less to offer a seat to those standing behind them. The little stall fills hundreds of stomachs every day; her customers are mostly office workers and schoolkids studying nearby. 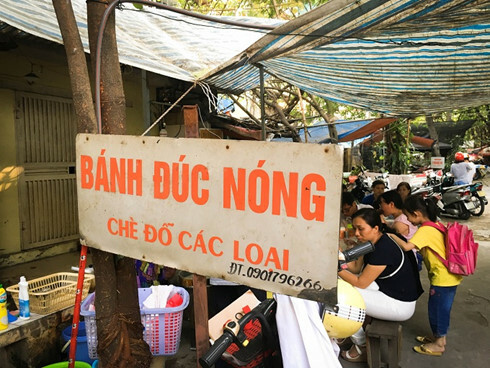 At around 5 p.m. Minh’s husband flips the sign over.Minh’s banh duc nong is a meal fit for purists: nothing but porridge, minced pork and fish sauce. “Closed” only three hours after opening.